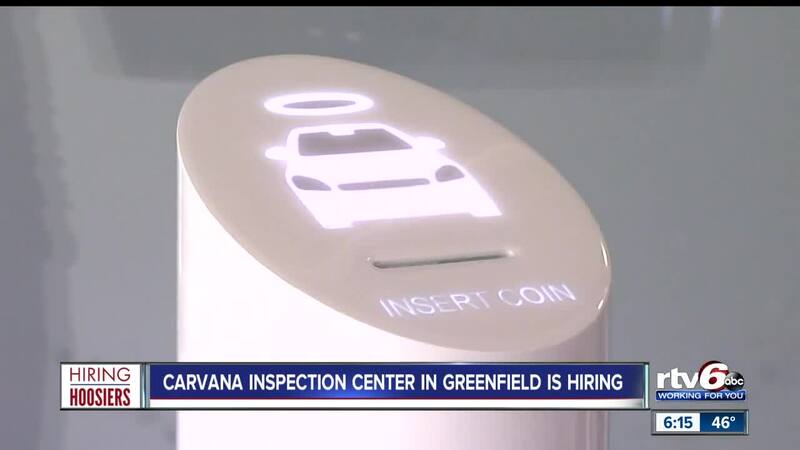 Carvana inspection center in Greenfield is hiring. GREENFIELD — A vending machine so big it dispenses cars can be seen on the northeast side of Indianapolis. That vending machine is known as Carvana. Before the cars reach that huge tower off I-69 near 82nd Street or your home, they go through rigorous inspection at another Indiana facility that wants to hire Hoosiers. Carvana's inspection center in Greenfield is now fully operational and looking to expand its employee base. The facility currently employs 100 people, and they're looking to get to 500. At these centers, employees inspect, recondition, photograph and store the company's 15,000 plus vehicle inventory. "We have a strong Indiana presence already, we have a Carvana vending machine in Indianapolis, providing delivery since 2016, have been expanding rapidly in the state," Carvana Associate Director of Communication, Amy O'Hara, said. "So we added two more markets today, South Bend and Elkhart, and we also plan to deliver to Fort Wayne. So it's been a growth state for us, and we're excited to expand even more." Carvana allows drivers to research, finance, trade-in and buy cars online or mobile devices. Buyers can go to the vending machine to receive their vehicle, or have it delivered to their home. Open positions at the inspection center run from entry level, all the way to management.. Check Carvana's website here for open positions.